Likes: High SPF protection, lovely matte feel. Cyclopentasiloxane, Dimethicone, Zinc Oxide, Alcohol, Water, Lauryl Methacrylate / Sodium Methacrylate Crosspolymer, Ethylhexyl Methoxycinnamate, Talc, Glycerin, Styrene / Stearyl Methacrylate Crosspolymer, Methicone, Polysilicone-9, PEF-12 Dimethicone, Titanium Dioxide, PEG-3 Dimethicone, Phenoxyethamol, Cetyl-PG Hydroxyethyl Palmitamide, Aluminium Hydroxide, Silica. Long lasting protection from sunlight and is suitable as a make-up base. A non-oily and non-sticky lotion that helps brighten skin and makes make-up stay longer. 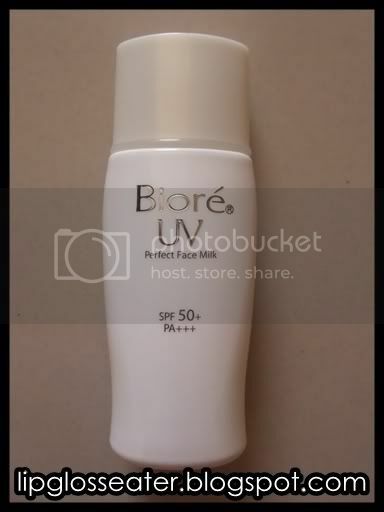 Effectively provides long lasting skin protection from harmful UV rays. 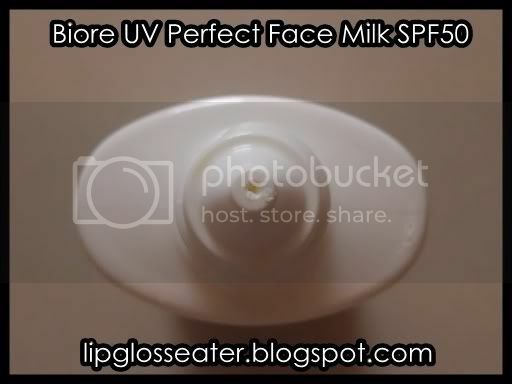 Suitable as a make up base to brighten skin before make up. Formulated with sebum absorbing powder to absorb excess oil and makes make-up stay longer. A light textured milk lotion and spreads smoothly and is quickly absorbed into the skin, leaving skin looking naturally smooth. Not scented and no colour added. This sunblock is priced at RM24.90 (approx. US$6.90) and it's almost always on sale! :) This is available at most Watsons / Guardian outlets. Credits: Product photo from Kao.com, UHU photo from Flexcoffice.com.my. i've been using this product for quite some time... so far it has not caused any problems !! by far the best sunblock i've ever used, though dior 1 is much better but it's just too expensive. too bad it didn't work out 4 u though :s i would love to try loreal after i finish my bottle! 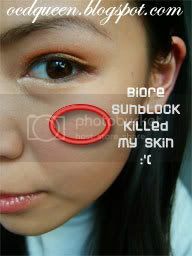 Yeah Biore's sunblocks are great if not for the fact that they have high content of alcohols, especially the gel type in a bluish-green bottle. Better whip out the Mint Julep mask now! 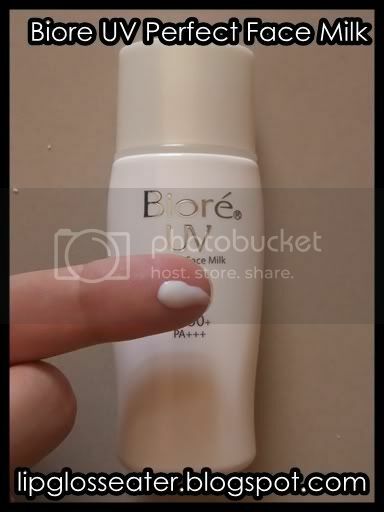 don't think you'll like the Loreal one then, since that one gives a shiny and a little sticky feel compared to this biore one!! hehehe!! Does it have a powdery feel after you apply it? Anyway, the one sunblock which really worked for my oily skin is from Nuskin. Comes in oily skin and dry skin formula. Hmmm... i think it does give a slight powder feel when you apply it! tho it's weird, it doesn't control my oilies as well as before dy. >_< and after using like 4 or 5 bottles, i sien. Hey girl, this is my one true love when it comes to sun protection. Tried Garnier n Loreal, they succeeded in making my face oily. So this is my HG for now. I recently blogged about this.